Physical Address: 798 Beech Bend Rd. Bowling Green, KY - Saturday’s action was highlighted by the Moser Sportsman Shootout. 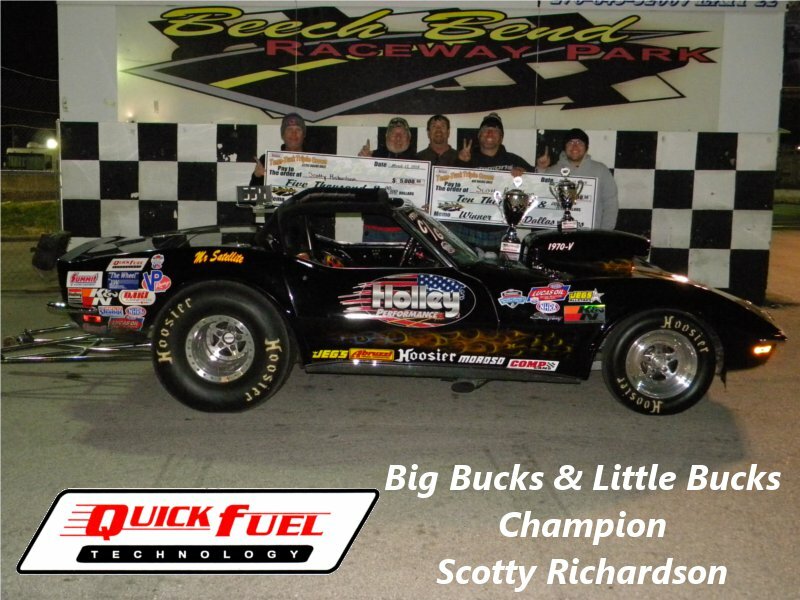 Racers from seven entirely different classes went against each other in head to head competition with Ed Dudley, Plainfield, Ind., taking the win over Chris Stephenson. Bowling Green, KY - Mark McDonald and Chad Axford took home the wins in Top Sportsman and Top Dragster presented by Racing RVs. McDonald put John Taylor on the trailer with a lap of 6.656 at 202.82 mph and Axford out ran No. 1 qualifier Matt Sackman with a 7.703 second 129.34 mph pass. 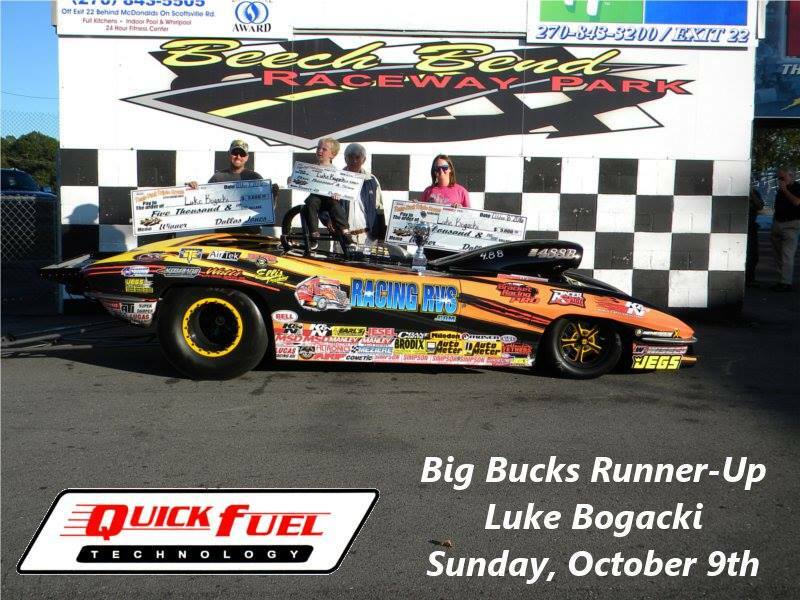 Bowling Green, KY - Knight, Richardson and Wiles all score $10,000 Victories in this past weekend's Tenn Tuck at Beech Bend Raceway in Bowling Green, Ky. Cadle and Richardson also took home $5,000 checks in the Little Bucks races. Click Here for More! Bowlinggreen, KY - In what has quickly become one of the finest weekends of sportsman racing the JEGS NHRA SPORTSnationals returns to Beech Bend Raceway Park in Bowling Green, Ky., for the third season on Memorial Day weekend, for three days of intense racing action. 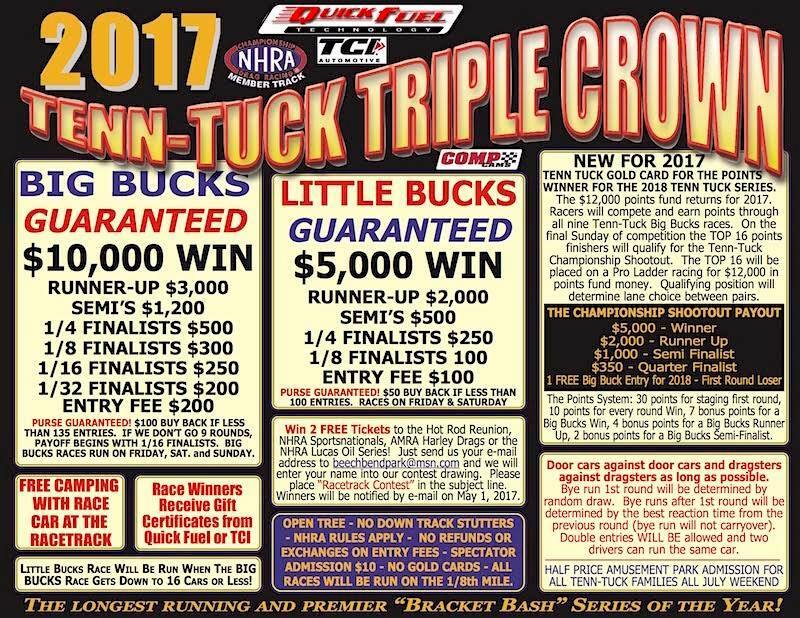 Bowling Green, KY - This weekend the "Historic" Tenn-Tuck returns to Beech Bend Raceway Park. The Mid South's best bracket racers will take their shot at 5 Big Money events at Bowling Green's premiere facility. CLICK HERE for Race Flyer! Glendora, CA - JEGS continues as title sponsor for the NHRA SPORTSnationals held at Beech Bend Raceway Park in Bowling Green, Ky., May 26-28, 2017. Carterville, IL - Bogacki hopes that his run of success at Bowling Green is a sign of things to come; he points to the next two weekends as the biggest events of his season. This week, Luke and his team head to Huntsville Dragway in Huntsville, AL for the final event of the DragRaceResults.com Ultimate Series.